The MIDNIGHT MAGIC necklace is a piece of boldly beautiful gemstone jewelry for the woman who is not afraid to make an elegant statement! 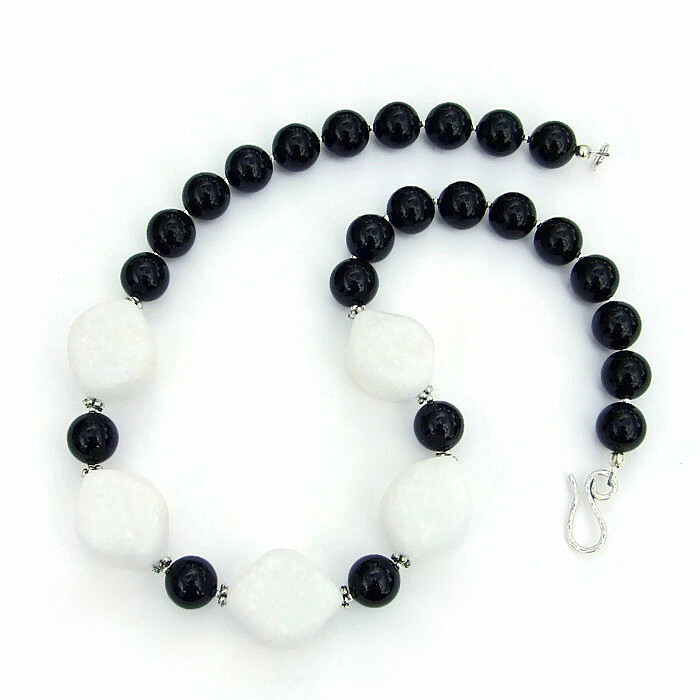 This chunky, one of a kind necklace features glittering white quartzite (sometimes called snow quartz) in a unique rounded diamond shape with a natural matte finish. Because of the distinctive crystalline structure of the quartzite, each gemstone exudes subtle, eye catching sparkle as the light plays across the surface. As the necklace is worn, the quartzite will roll, adding kinetic energy to the design. The quartzite is on the chunkier side but is not overpowering or extremely heavy. Sterling silver daisy spacers frame each quartzite diamond. Since black and white is such a classic combination, super shiny black jade rounds were used to take that combination to a whole new level. Black jade gets its lustrous color from high amounts of iron and/or graphite. Because it is very dense and tough, it has been valued for centuries to make weapons and tools. 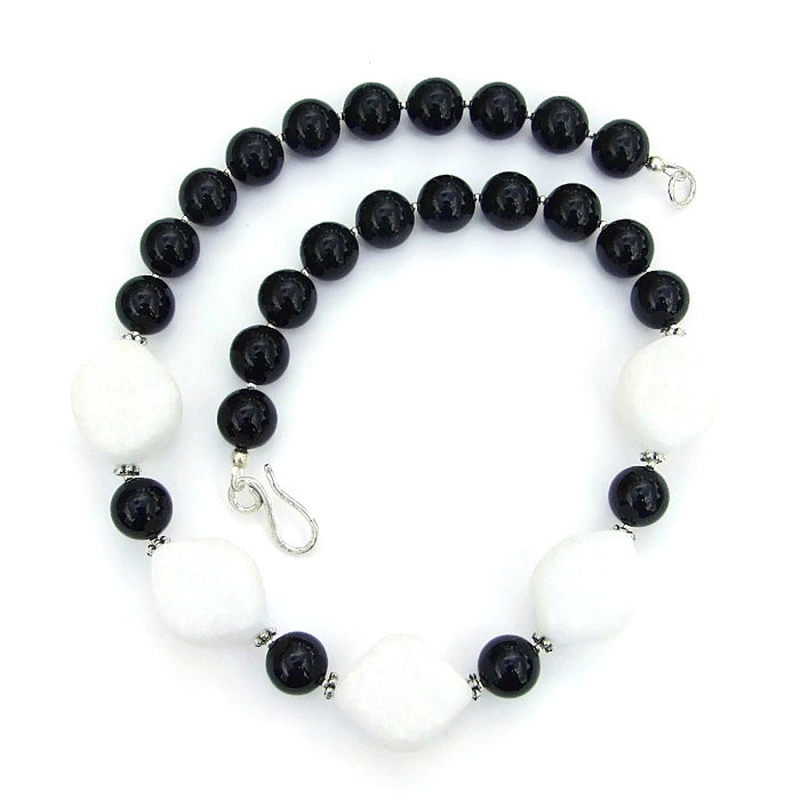 Today, black jade is very popular in trendy jewelry. Small sterling silver beads separate each gemstone from the other. From dress up (little black dress?) to casual clothes (white t-shirt and black jeans, perhaps? 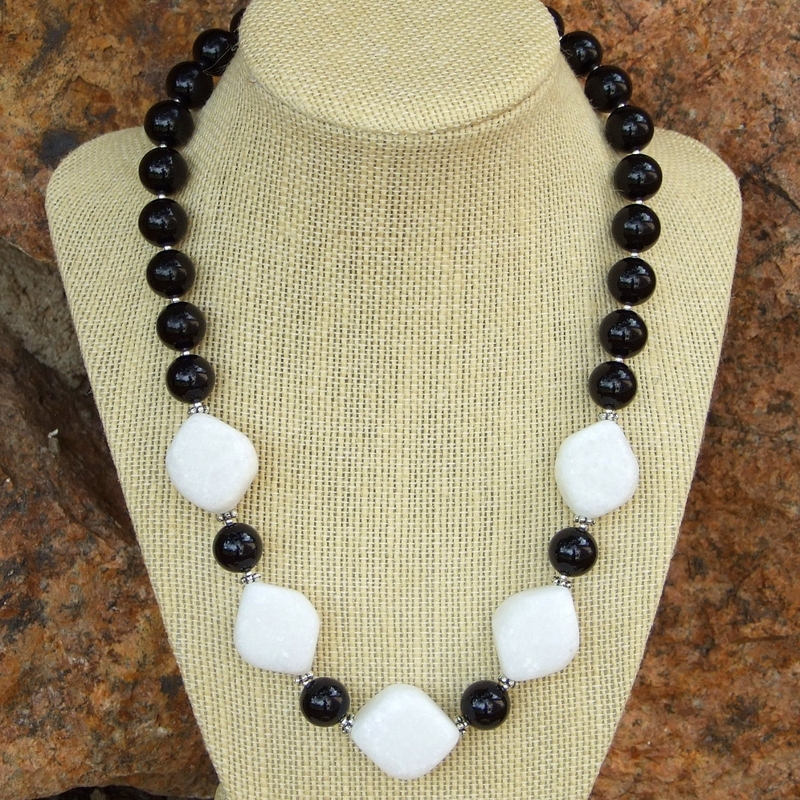 ), the chunky necklace will definitely show your extreme good taste each time it is worn. Carefully designed and handmade by Catherine of Shadow Dog Designs, MIDNIGHT MAGIC will be a necklace you will treasure for many years to come. For a better understanding of the relative size of the white quartzite and black jade used in the MIDNIGHT MAGIC necklace, please be sure to check out photo #5 for a size comparison with a quarter. Quartzite is said to help stabilize positive changes in your life. 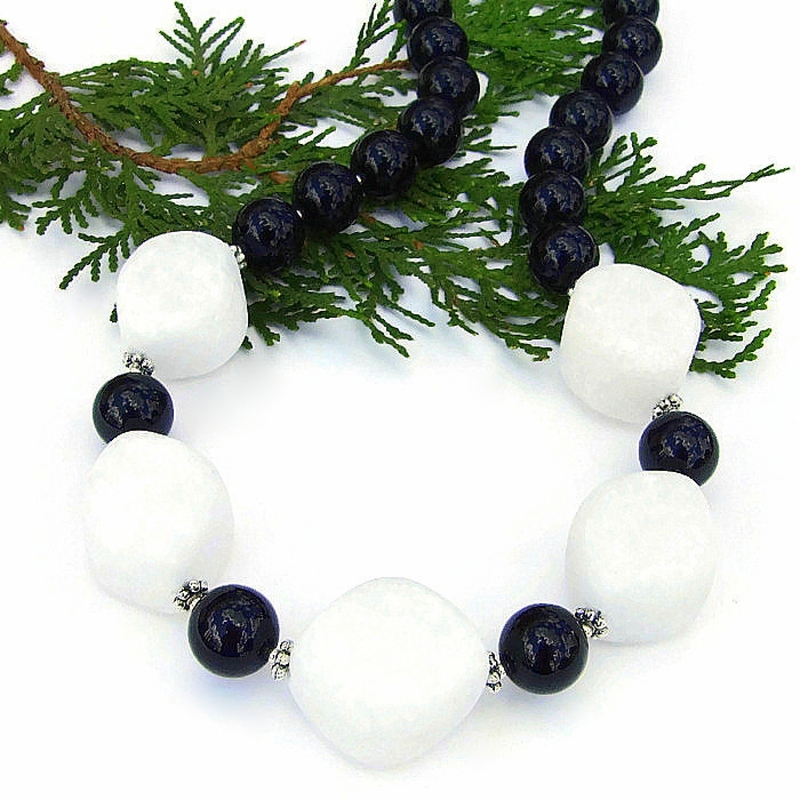 Black Jade is believed to offer protection from negativity. Silver is a metal of love and healing; it is a mirror to the soul, helping us to see ourselves as others see us. The MIDNIGHT MAGIC handmade artisan gemstone necklace was carefully designed and handmade in a dog friendly, smoke free studio. The necklace will come with two informational drop tags: one with the piece's name; the other lists the materials used in the necklace and the language of the stones and metals. It will be carefully packed in an organza jewelry bag, perfect for gift giving to a loved one . . . or to yourself! ***Please be aware that not all computer monitors exhibit colors exactly the same. The colors of the stones are extremely close to the actual color on my monitor. They may appear lighter or darker on yours.